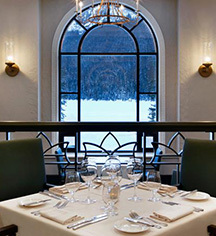 Guests of Fairmont Chateau Lake Louise never have to venture far for a delectable meal. Protecting the tradition of hospitality has cultivated a rich eating experience for guests far and wide. Offering seven different on-site locations for meals, Fairmont Chateau Lake Louise provides guests with cuisine that includes the freshest, local ingredients from regional farmers, purveyors, and artisans. The chefs at Fairmont Chateau Lake Louise combine classic and contemporary cooking techniques to supply an unrivaled dining experience. The Western Canadian menus pay homage to Swiss heritage and allow guests to have an authentic feast. Fondue, afternoon tea, fine dining, casual bistro style, and more are available at Fairmont Chateau Lake Louise. In-room dining is also available. With hearty, alpine-inspired foods and local craft beers, and inspired by the glory days of Canadian mountaineering, Alpine Social is the place to meet, eat and celebrate. Open 24 hours a day, the Chateau Deli offers a variety of tasty hot meals, home-made soup, fresh salads, sandwiches, baked goods, and desserts to sit and enjoy or take-out. 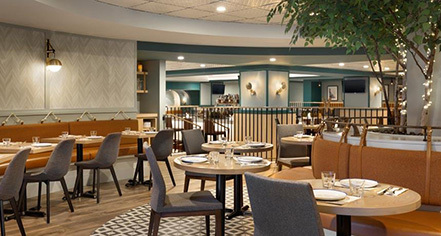 Savor the very best in contemporary Canadian cuisine at Fairview, where stylish décor, spectacular views, and attentive service create the perfect ambiance for a memorable dining experience at Fairview. The flavors of Italy come alive in the warm and casual setting in the Canadian Rockies at the Lago Italian Kitchen. The menu captures the true essence of traditional Italian cuisine and is crafted using fresh, locally-sourced ingredients. One of the most iconic lobby lounges in the Canadian Rockies, the Lakeview Lounge offers a charming and elegant setting to sip on a sophisticated cocktail or an illustrious wine. Sit back, relax and admire the spectacular, world-class views of Lake Louise and Victoria Glacier. With a delicious, gourmet buffet breakfast prepared daily, guest can indulge in the outstanding assortment breakfast items or enjoy the classics from the à la carte menu, all while admiring awe-inspiring views of Lake Louise and the mountains. Featuring innovative European alpine cuisine, guests can choose from a tempting variety of classic Swiss, German, and Alpine dishes at the Walliser Stube. Notably, guests can experience authentic Swiss Fondue, an homage to the hotel's Swiss Mountain Guide heritage.